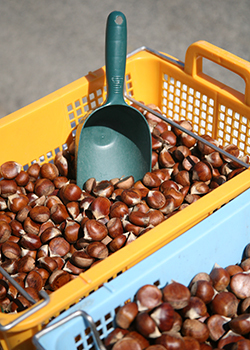 Our fresh chestnuts are available by the pound, plus shipping and handling cost. We offer 2 options for shipping: 0-10lbs at $16.30 and 11-17lbs at $21.20. Our shipping prices include tracking and insurance, and we ship orders on Mondays and Tuesdays so that the chestnuts stay as fresh as possible. Prices on our website are for USA Orders Shipped to the 48 Continental States. We can also ship outside of the US, so please inquire for more info if needed. We do sell out every year, so be sure to order as soon as possible! To order, please call us at (209) 874-3237. Let us know which size and how many pounds you are interested in, and we will send you an invoice. If you have any questions, please let us know!